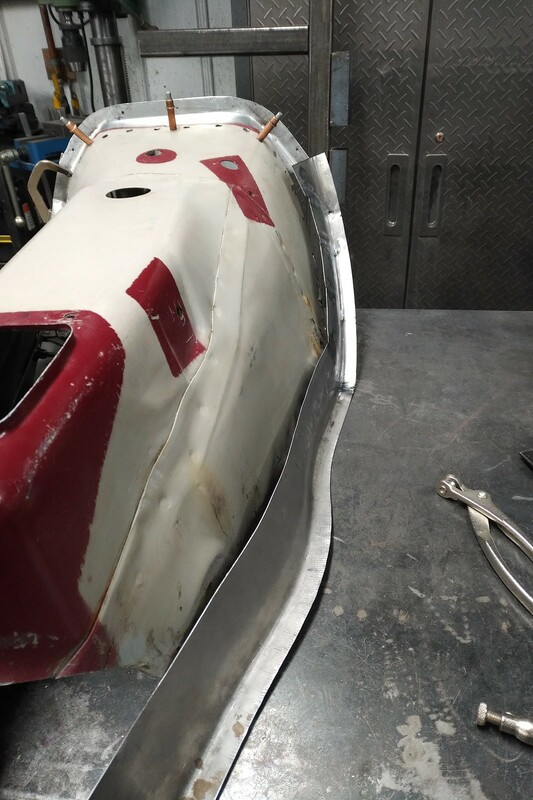 Still working on the side flanges...but each day, a little more gets done. 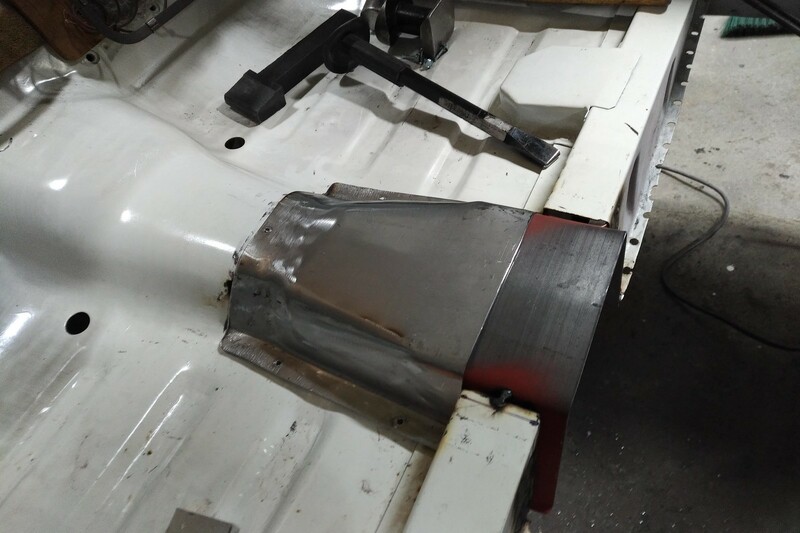 First, a little sheet metal welding. 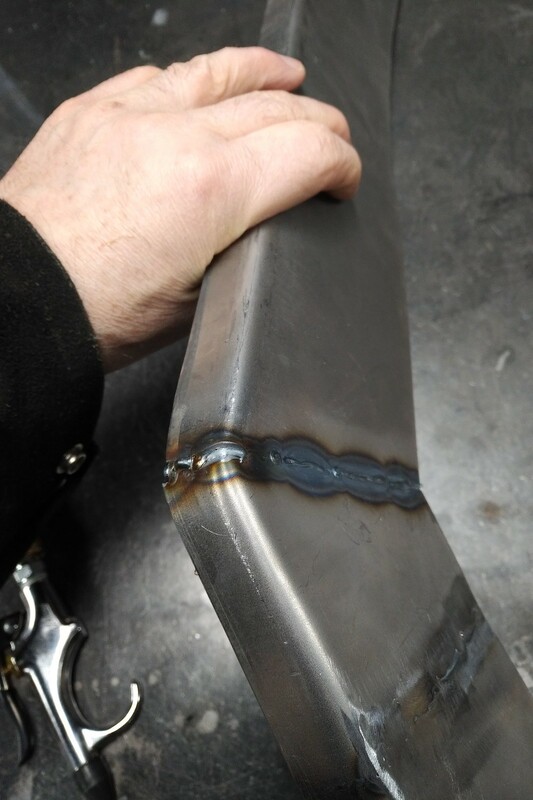 Now that's welded. 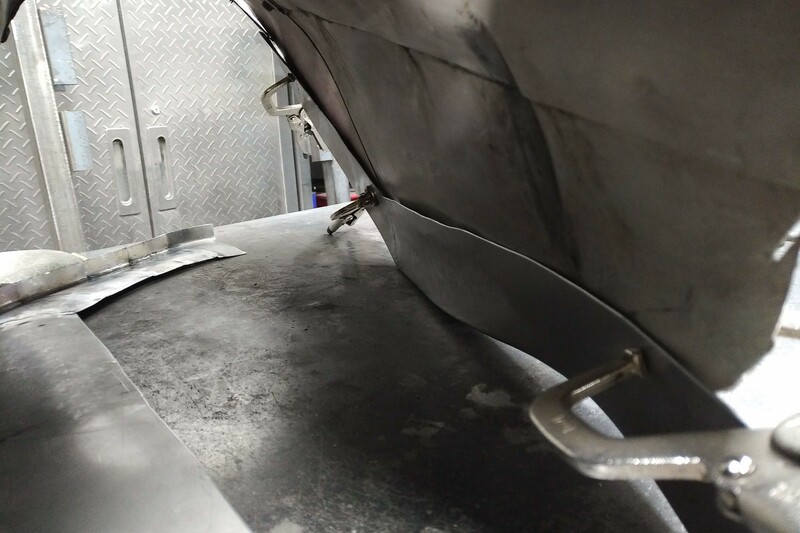 Tacks are clearly visible and the weld is fully penetrated. Wrapped corners (just for the welders...sort of an inside joke). These have very low distortion and can be effectively hammered. 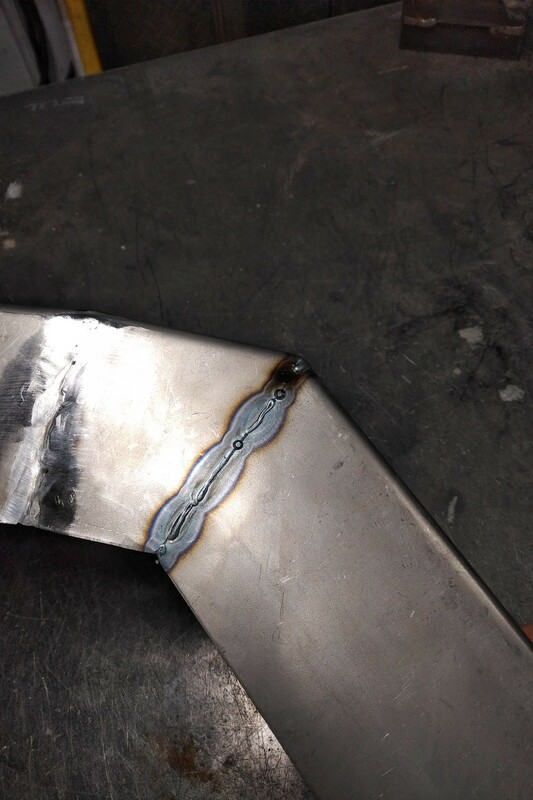 Not a gas or TIG weld, but it's a tunnel. We're going to be needing a bunch of shape to get this to close up nicely. I hand hammered these (no E-Wheel yet) - just using a shot bag and hammers. That's more like it - a lot of shape actually. The shape added is a bit more evident from this angle. It's also clear that I need to shrink that top edge to get the flange to sit flat again. No big deal. Moving along - should have it all installed this weekend. Woo hoo. Anyone reading this thread know anything about drivelines? Specifically, driveline angles for 2-piece shafts. 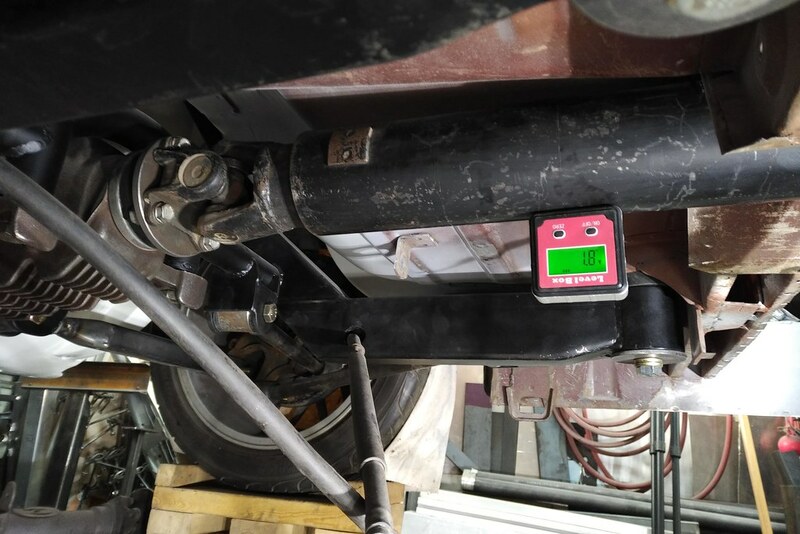 The differential sits at 0º and the engine is at 3.4º. 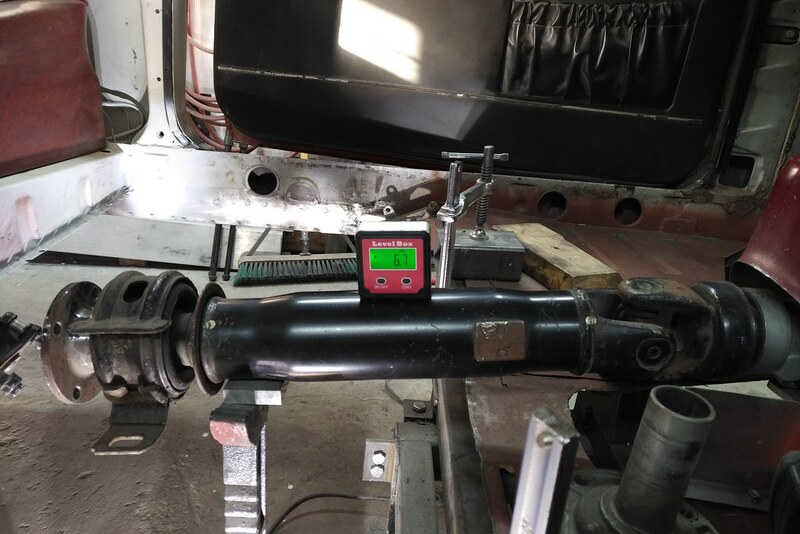 The Spicer calculator says that I've got to run the operating angles of the ends of the shaft at +- 1º with no operating angles greater than 3º for vibration free performance. This means the angle of the first shaft has to be 6º and the second shaft should be 3º to yield operating angles of 2.6º, 3º and 3º. Has to come up a bit. Floor tunnel section needs to be cut - this is on the floor (it's really 2º). So before I cut things...does this make sense. I know the front shaft will need to be lengthened...I'd like to know have to do this over. They get into two piece near the bottom of the page. Of course mine is a one piece so a bit simpler. 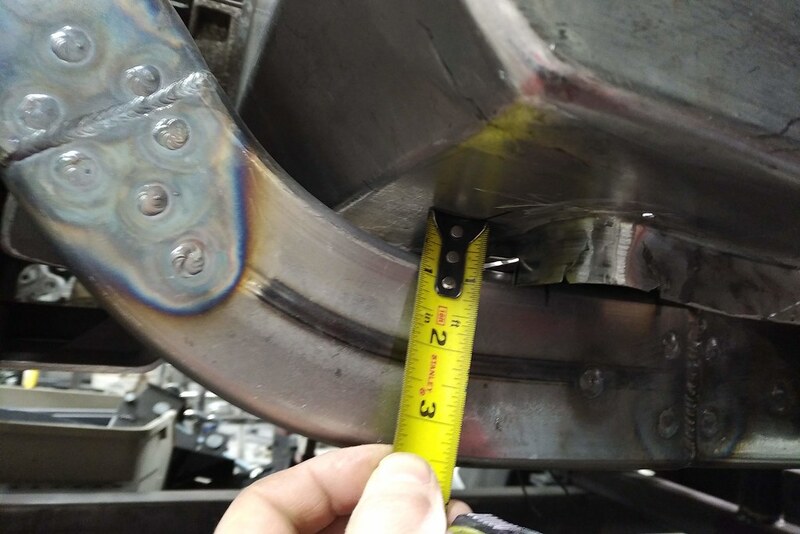 If your trans output to pinion flange is less than 51" (1295.4 mm) you could run a one piece, too, according to the link. If you can't change the pinion angle from 0* maybe you could play with the motor mounts to get the output angle to 0* as well. Then the difference in the heights of the two ends would provide some angle in the shaft, not more than 6*, so the needles will rotate. That's for a one piece, of course. Sitting here scratching my head it seems that with the pinion angle locked at 0* you'll still have to change the trans output angle to close to 0*. Than the front shaft could drop so it's angle is 1* or 2*, within the tolerance to match the pinion angle. 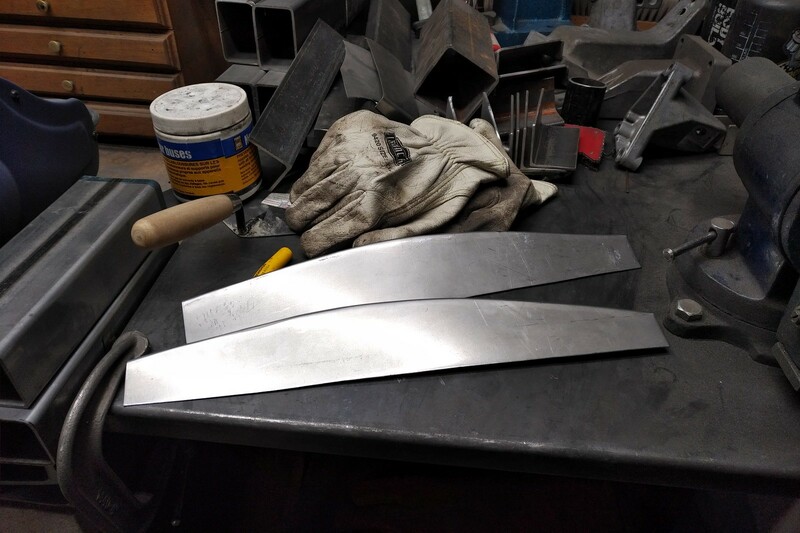 But then the distance between the two joints is much shorter and so the angle of the shaft will be much steeper, which I think will cause it's angle to be out of tolerance. This all depends on the difference in height between the trans and pinion. My head hurts now, thanks a lot! 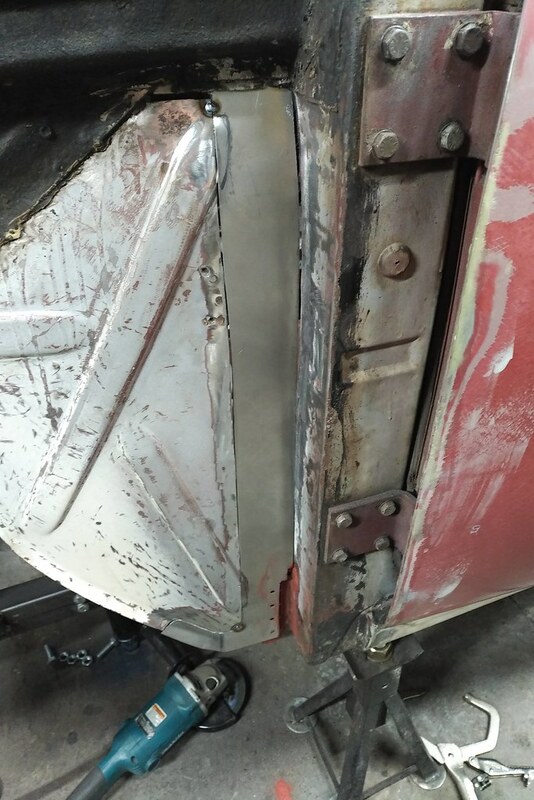 The only way to change the "drive" (engine/trans) angle would be to raise the rear of the trans...we're a little tight up front, so there is no more down. If I raised the trans to the same angle as the diff, then the operating angle of the u-joints go up and the offset between the two (drive and driven) are increasing and this is also wrong. I ran the data through the Spicer torsion/vibration calculator and what I've got is as good as it's going to get...it won't be smooth, but I don't see a way out of this either. Tilting the diff up (which others have suggested), makes it worse not better in the calculator. Nice updates and cool calculators/software on the Spicer site, https://spicerparts.com/calculators/...gle-calculator. Dealing with drive shaft alignment on my 240 now and I think i kinda understand half of it so I can't possibly give advice. Maybe I can find stuff in my Ebooks, some driveline handbooks. I'll let you know. I'm not too sure how much further we need to go down the rabbit hole - the good books on the subject are locked up behind a pay wall and I can't get at them (for less than $100 USD - I hate that. So the next best thing is to call the guys at Tech Support at Spicer and lay it all out for them. Aside from the horrific elevator muzak, the tech was nice and knew what he was talking about. Feed this thing with my angles (drive = 3.4 down, shaft 1 = 6 down, shaft 2 = 3 down and driven =0) so this leaves the following operating angles, first joint = 2.6, middle = 3, differential = 3. The details says that if I run the first joint and the last joint in the series no more than 1 degree different and nothing over 3 degrees...so all good. On the edge, but not against the rules. It's just operating angles - nothing fancy. If it's outside of these parameters, the calculator tells you that death will ensue. Next up - The Torsional Analysis calculator- https://spicerparts.com/calculators/...sis-calculator This tool will give an estimate of various predicted torsional and inertial effects that can damage many of the driveline components in a vehicle. You need more data - length of the shafts and distance the diff is off the centre line. So to the above data we add, shaft 1 will be 26" long and shaft 2 is 22" long. The diff is 1.875" off the centre line. Bung this in putting all the off set to shaft 2. Then set the shaft RPM to 3000 for the first run. Inertia Effects (Drive) - usually caused by a large operating angle at drive end of driveshaft. Inertia Effects (Driven) - usually caused by a large operating angle at driven end of driveshaft. * Max. Allowable Torsional - 300 Rad/Sec/Sec Torsional - usually caused by large, unequal operating angles or out of phase driveshafts. 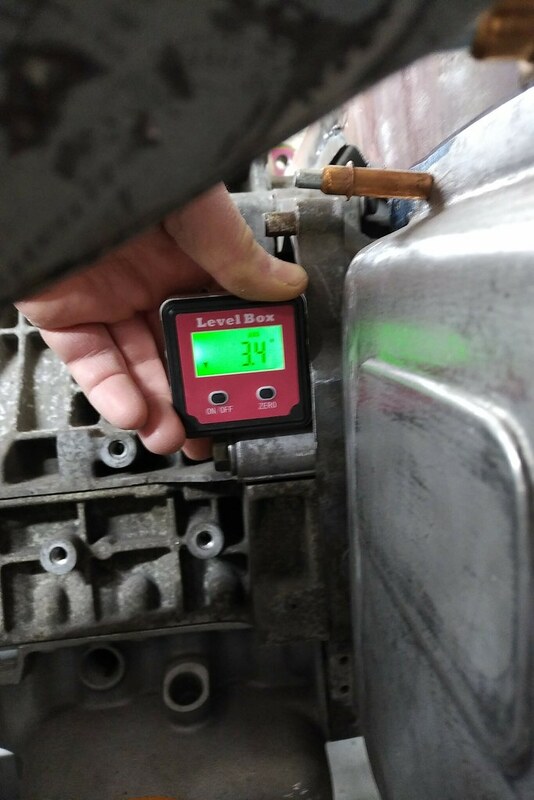 So at 3000 RPM, it's above the max allowable at the transmission and over twice allowable at the differential...let's not talk about torsional limits. Yikes. 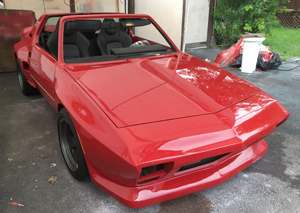 I ask the tech - he says "If the calculator runs, it's going to be OK - it won't fail" - I reply that it may be like driving in a paint shaker...he doesn't respond to my witty retort. Hey, it was Monday morning...I understand. So then I change a few things. Basically, I ran a quick and dirty sensitivity analysis - without changing the drive or driven angles. First, I varied the speed. 3000 RPM is around cruise on the highway - so not really smooth (hard to know what all this means, but most things in my car are not well isolated for NVH and I'm not all that sensitive to it, but let's be realistic). So I up the RPM to 5K...calculator still works. 7K - BANG - it gives the warning about death. Wonderful - let's do this. No idea what it all means, but inertial effects are below tolerance and the torsional thing is only double what it should be...plus a little. 6K Well, if it wasn't going to do 5...I tried it anyway. WTF. I tried every which way to move angles and offsets and it all blows up. Nice. I found the optimal solution by looking at it. It still won't work well, but it will work. Just don't drive it fast. Ya, right. So what about a one piece. I did this and the shaft angle is 4.6º (3.4 and 0º for drive and driven) - so I can't make it past the first calculator. 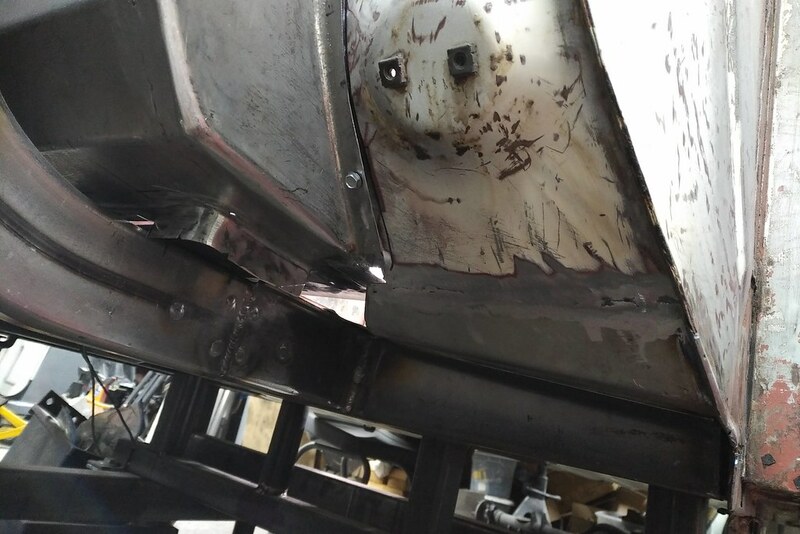 The angle results from the engine being higher than the diff...and I can't tilt the diff up 3º without having to cut apart the rear subframe for the 4th time. Now looking at CV joints instead of U-joints. Trying to work on this right now. I have, once again, run up against manufacturers that are a little puzzled by what I'm doing and aren't particularly helpful. You'd think they made their living selling stuff to people. Craig, just how difficult would it be to raise the trans end of the drive shaft to 0* to 1* of drop? I know it would put a bit of stress on the front motor mounts (should have gone with those Jags!!) but that can be addressed as well. If possible to do that you could easily run a one piece and be within specs, JMO. Ya, that's the guy I'm talking to...they're just more of a one line email reply when I'm more of a let's have a 5 minute discussion on the phone so we don't waste each other's time on this stuff sort of guy. I'll see what comes of it - it's starting to annoy me a little. Moving the engine to 0º does a few undesirable things. If the back comes up (and it would be about 50 - 60 mm - then that's too high at the rear and the front would come down. I'd have to reset the trans tunnel, which I just finished. 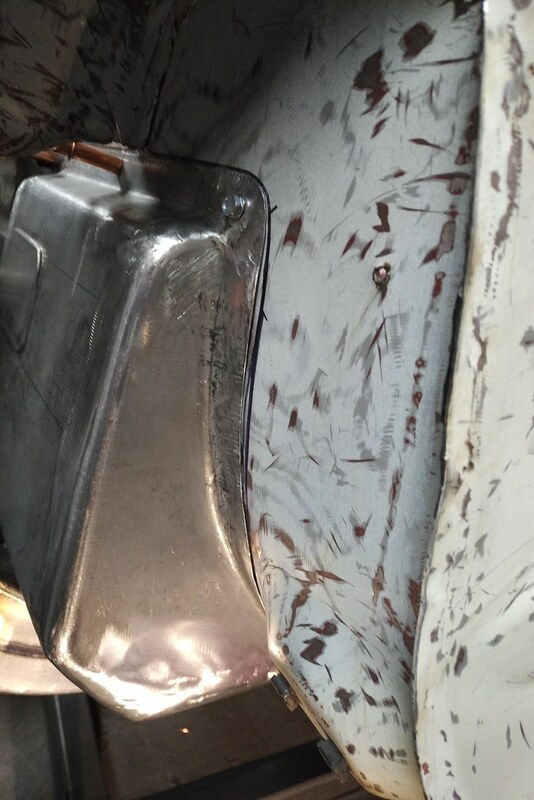 And the oil pan is set at 3º down. Then the front would also come down...and bang, into that damn steering rack. I just think it's best to spend the money on the drive shaft and be done with it - I don't want this thing to be some underivable monstrosity. If driveshaft buddy doesn't smarten up, I'll just grab parts and fabricobble it together. Last edited by Canuck; 11-20-2018 at 09:33 PM..
We've got an update video. Update time - here's the latest video update. I'll probably write a post when the rest gets done. So if you didn't watch the video...here's the related post. With the drive shaft clearly not fitting...I needed one inch more in the rear cross member to get the clearance that I needed to run a one piece drive shaft. The plasma came out, things got cut, and then I fabricated more stuff that got put back into the car. 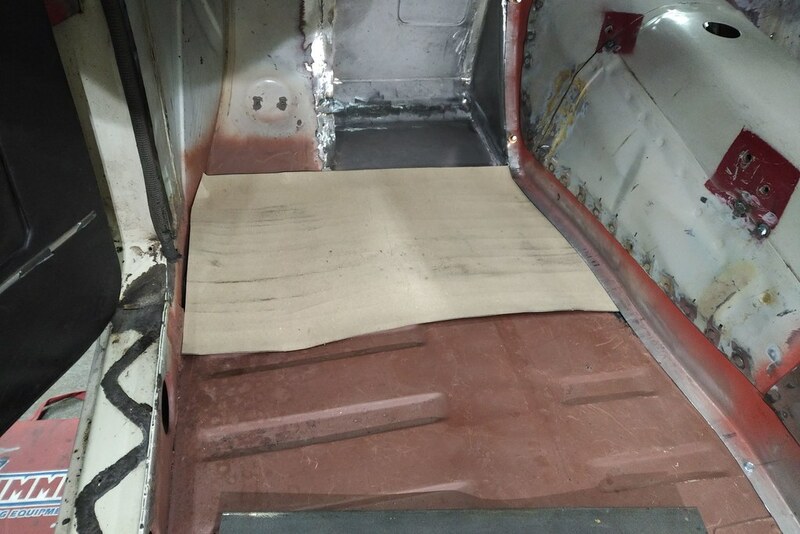 Yes, that's a big hole in my freshly painted rear seat pan. Oh well. 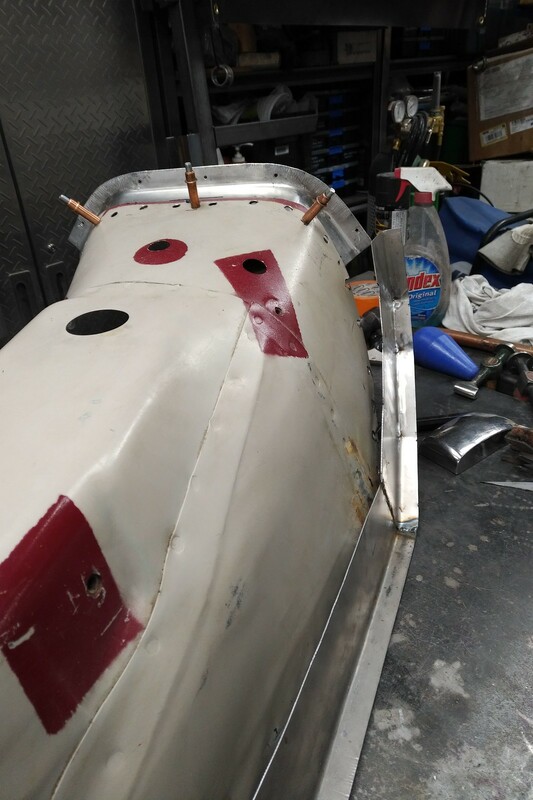 I didn't take any pictures of getting the back sheet metal put back in place. It involved a template, some shrinking and a little T-Dolly work. 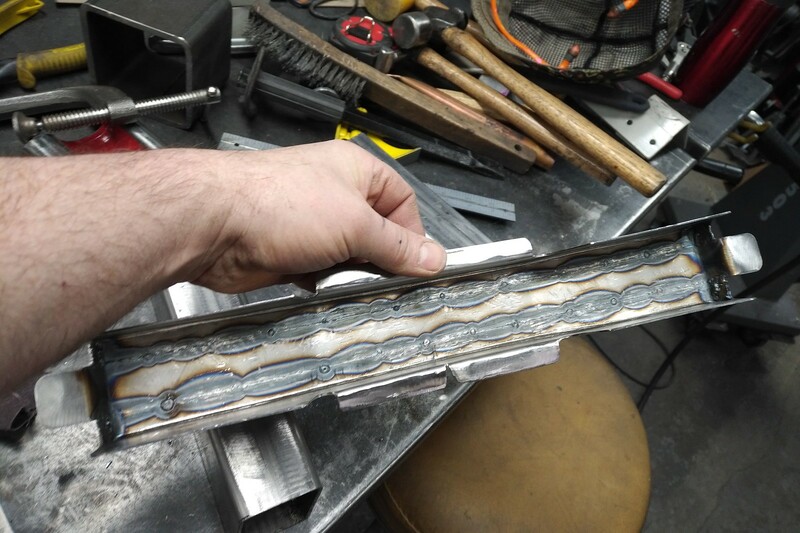 Oh, and a little welding. Here you can see what I've done a little better. 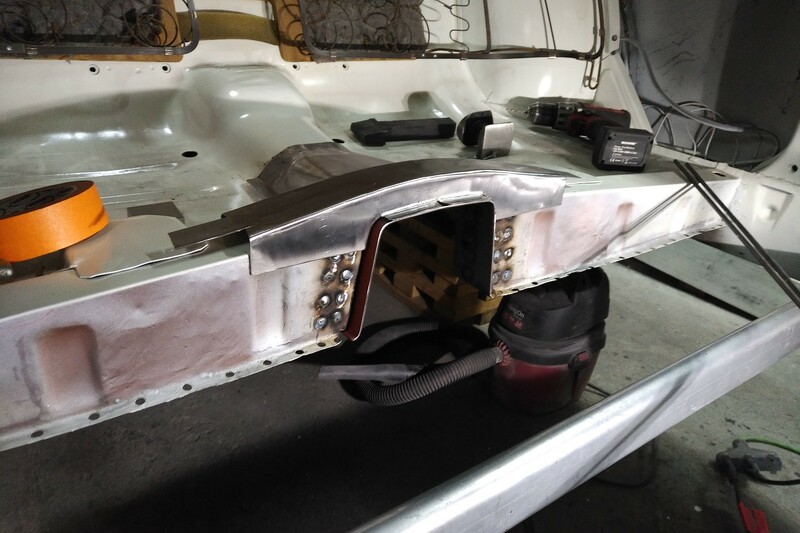 There were some 16 ga box sections added inside the cross member and plug welded in place. Then the 3 mm steel hoop was bashed out and plug welded into those box sections. 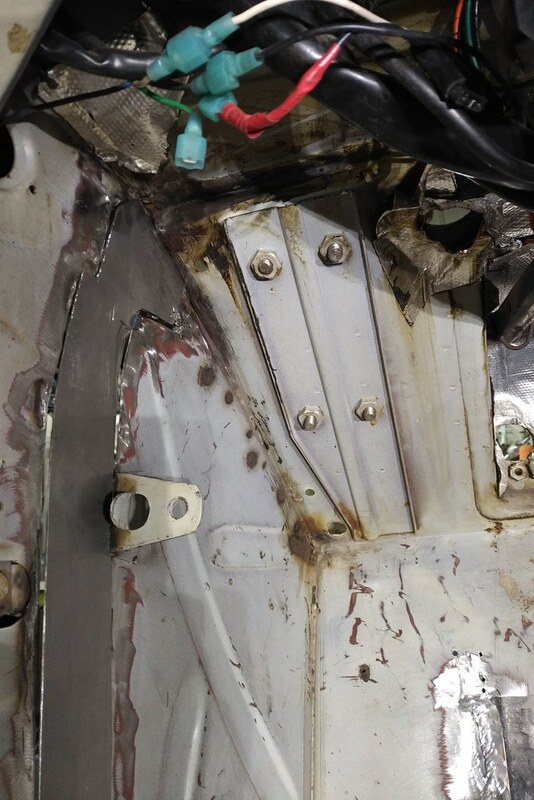 Then the sheet metal goes over all that mess. Just a little clean up and it's fitted. 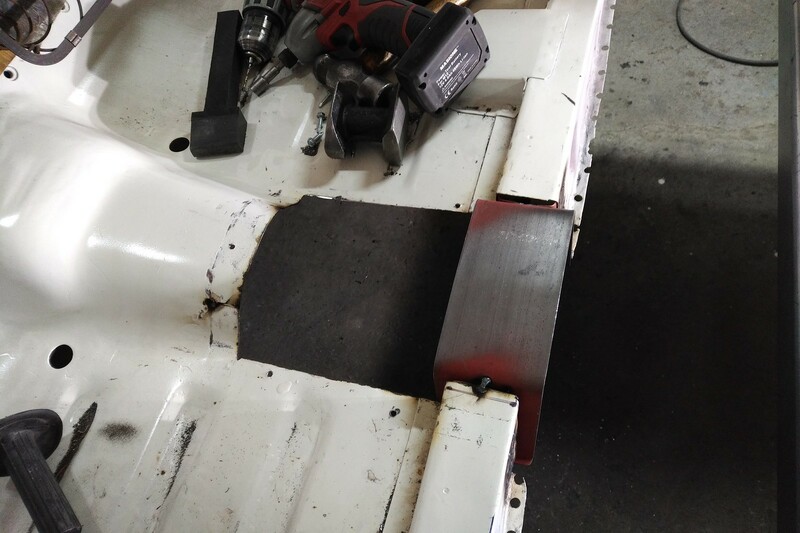 I've added a crease in the top of the sheet metal to get the fit perfect. 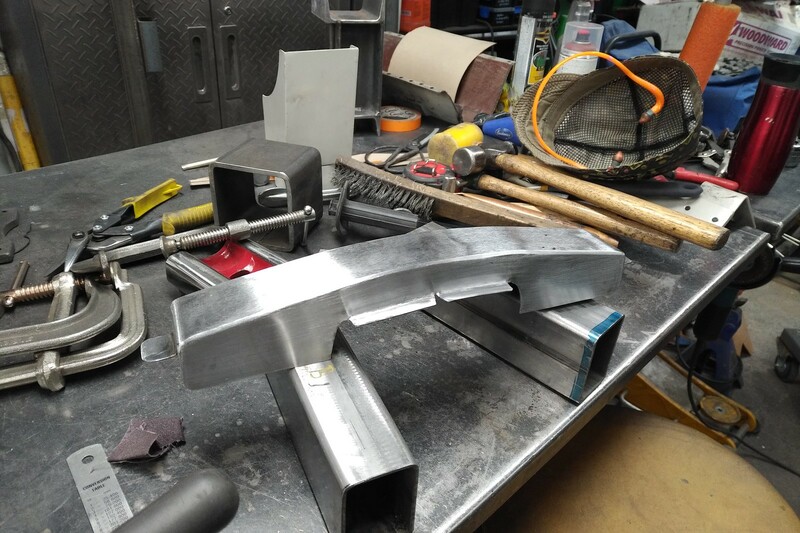 The angle of the shaft will allow me to add the original drive shaft loop/cross member stiffener to the base of this when the foot pans are back in place. I will need to add some strength to the top. So I used my tipping wheel on the bead roller to turn out these panels. That fit together with this strip. And get all welded up and finished off. That sits over this like so. So now..it's on to finishing up the trans tunnel and getting a drive shaft tunnel built. I hate rework - but here we are. This pedal box has been doing my head in. I could have finished this a year ago, but something was just not right. I've done an episode on making the little shelf thing and was kidding myself that this would be OK as the area needs a false floor anyway. 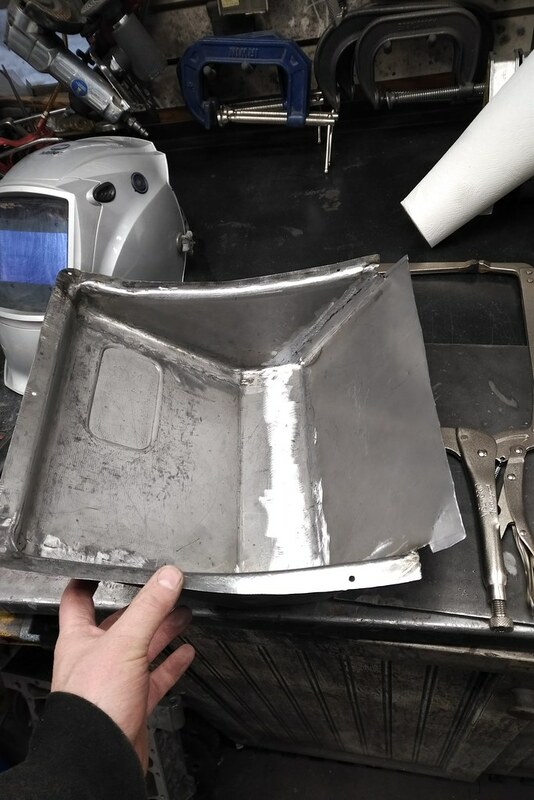 Well it's come time to fish or cut bait as I begin to wrap up the interior sheet metal. I don't like it. It doesn't feel right. So it's coming out. The photo makes the fit look worse than it is...I just jammed the floor part in there last night in disgust/despair. Now, I spent two nights freezing my arse off on the frozen concrete looking at this mess muttering to myself. You get the picture. 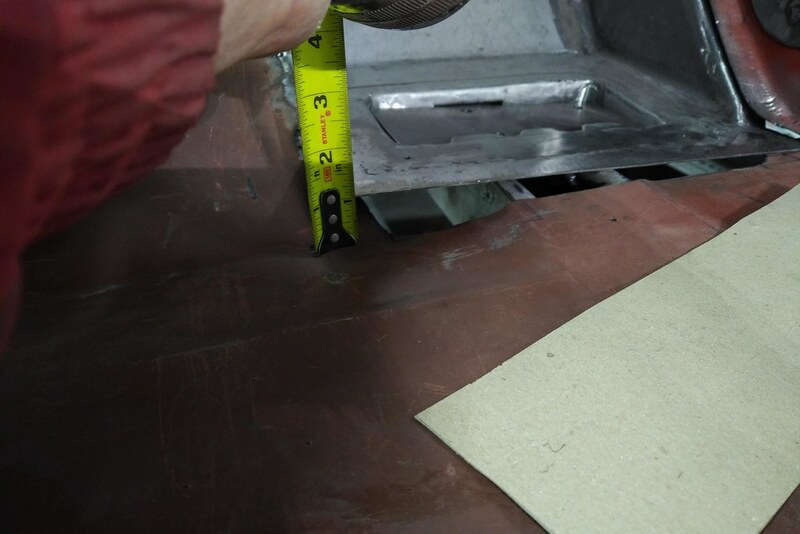 At the far edge of the repair, we're 1" off the floor...but only fractionally off the rail. So why am I compensating for a floor (that I put there) that's clearly in the wrong place. That's got to go. In case you're wondering...it all fits nicely - but this does need to be sorted before the trans tunnel goes in. So I'm not being random for once. I wasn't sure how I'd make a silk purse out of this sow's ear either...so that'll bug me forever. No way to close all this up against moisture and dirt. And I'm super not pleased that the pedal box is 3/4" off the rail. I want it on the rail. So I'm going to fix all of this somehow. 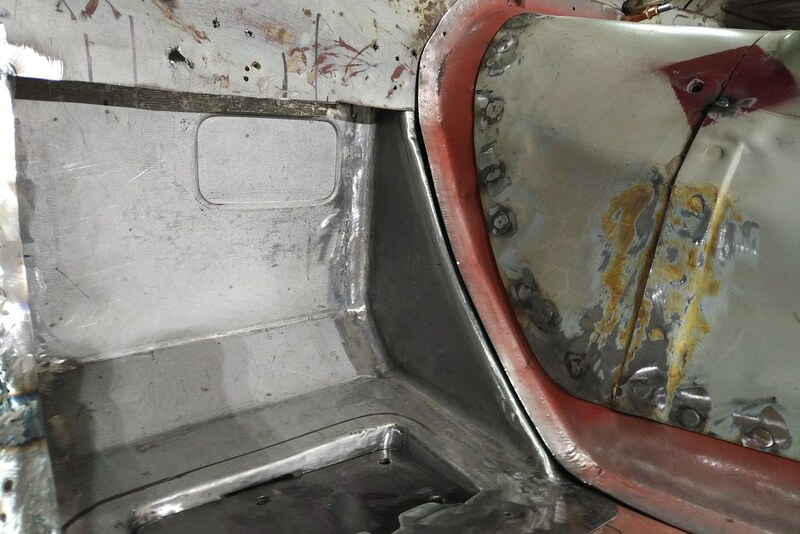 I've also discovered that the bulkhead closing panel is a bit pitted and really just the flange needs to go, so it'll go. Anyway, this will take a few days to put right. After two tries to get it right, the pedal box is finally done. I've replaced the bottom and made it 3/4" deeper and changed the angle to fit the frame. I took the time to tune the flange fit when the bottom was separated. 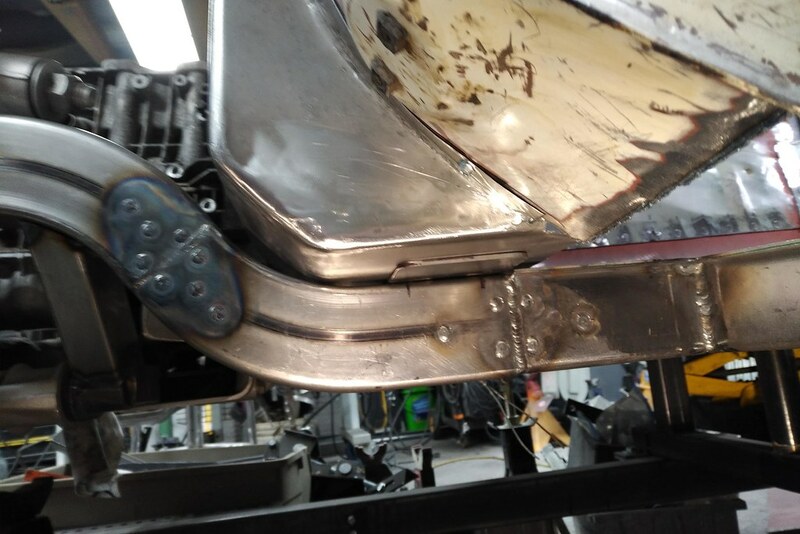 Much easier to move the flange when you don't have to fight the entire part. Got it to fit great. First fit - like a glove. Laying out the template for the new floor. Much better. Tomorrow the floor gets shaped and welded in. 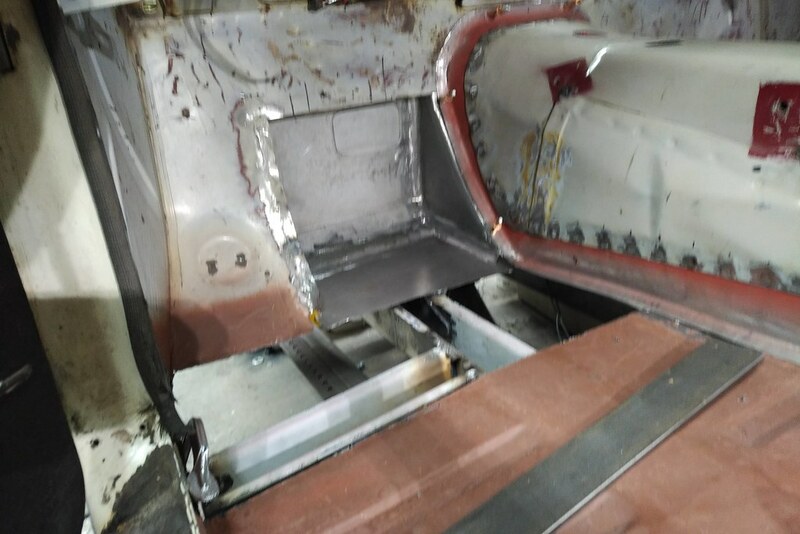 Then the pedal box will get a final fit and be ready to weld up. It's been said many times but I have to say, amazing work! I would be interested in seeing some of your methods. Such as how you do the floor pan corrugations. Also methods you use for getting your jigs flat and square. Thanks. I was going to do a few "How Too" videos. 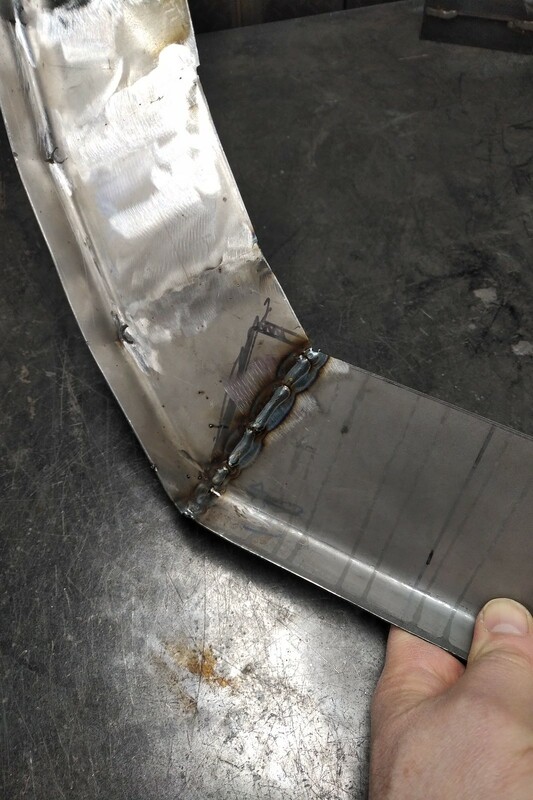 I thought I'd start with how to weld sheet metal. Panel layout is a little more of an art. 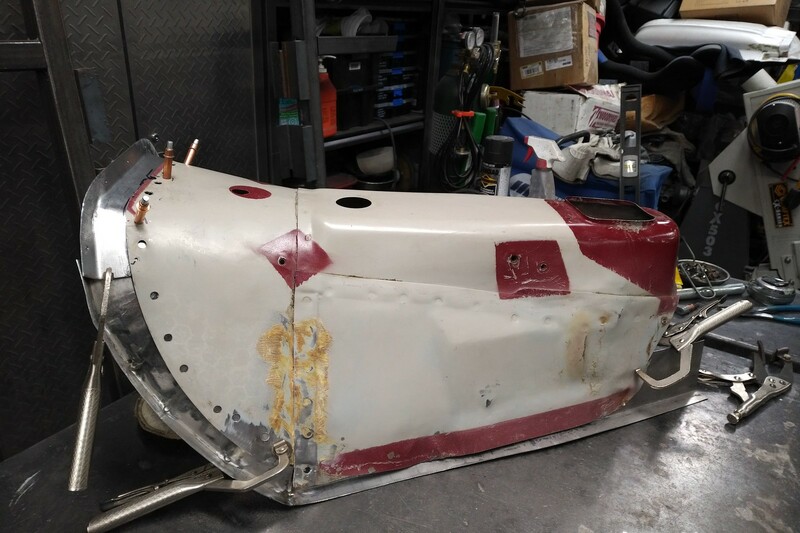 Rust repair...that sort of thing. I don't have any fancy tools (aside from the welders), so I can't do some fancy tricks. Thank you for continuing & sharing it all ! Thanks Hussein - glad you're finding the work worth watching! I didn't take before pictures on this section. 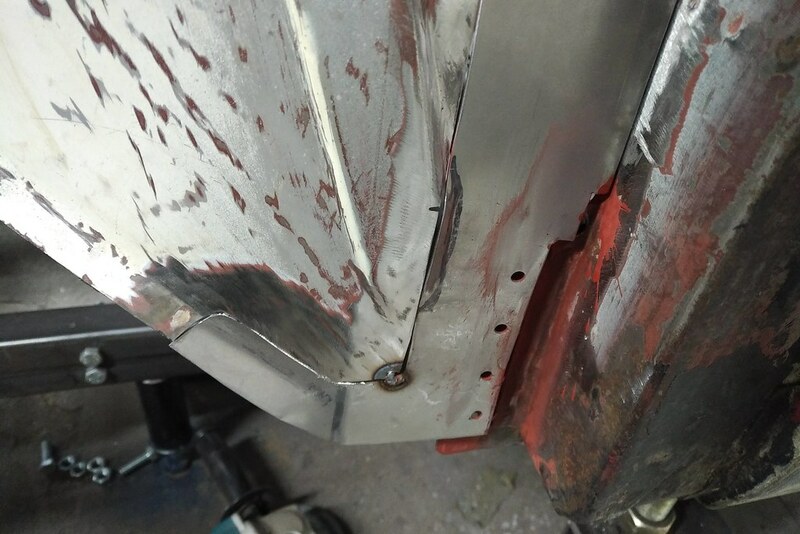 The bulkhead closing panel was showing rust between the sheet metal layers with some heavy pitting. Rather than imagine this wasn't going to be a problem, I selected to just cut it out. 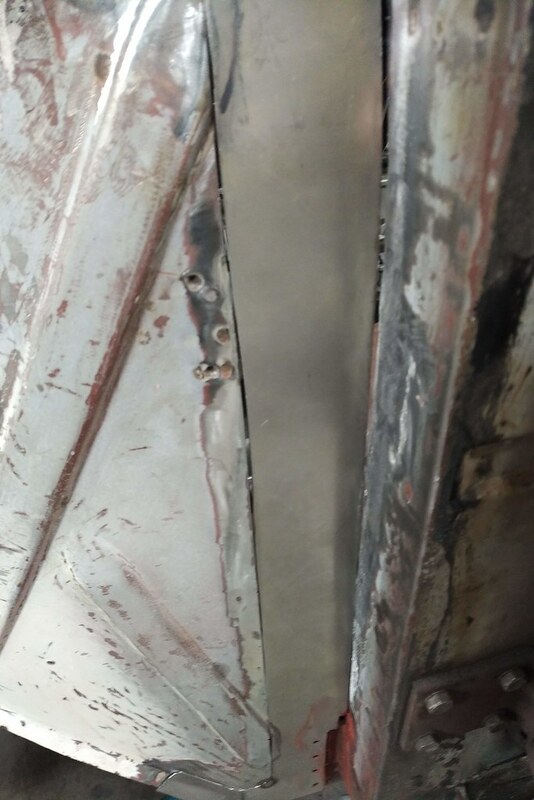 I then welded the 2 layers that make up the outer of the A-pillar, then will weld the new sheet metal to the post. 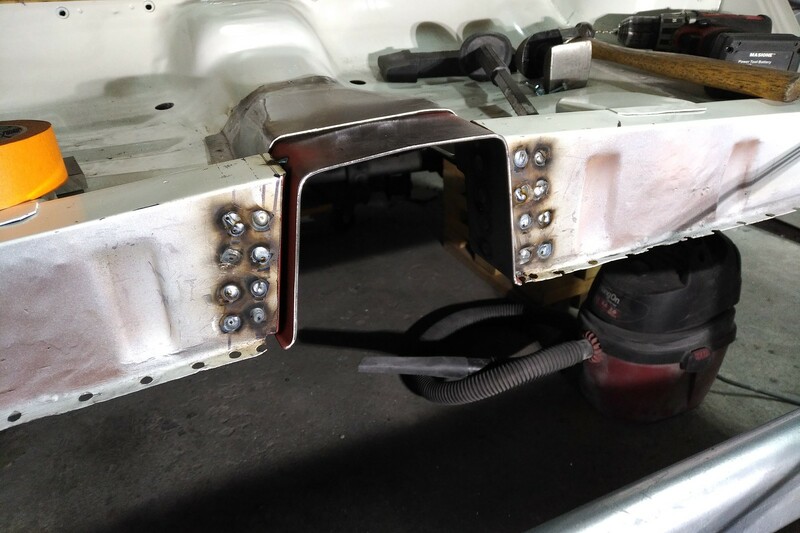 This will solve flex issues and cure the rust at the same time. There was also a small rust patch about half way up the pillar. It was a difficult panel to fit because it's not just the outside, but the inside. So getting it all into place was an entire day. I've also replicated the swages - not that anyone will care or know when done. It takes time to get the fitment just how I like it. The larger "gap" by the A-pillar is only because the panel needs to move to the pillar. Here's the inside of the repair. Here's the bottom of the panel - this is why this stuff takes time. More updates as this panel gets finished. Craig, now is the perfect time to open up the foot boxes. Your big brogans will be glad you did!! I've thought about it. With the floor mounted pedals, I actually have plenty of room to the left. Lots of room for a dead pedal. 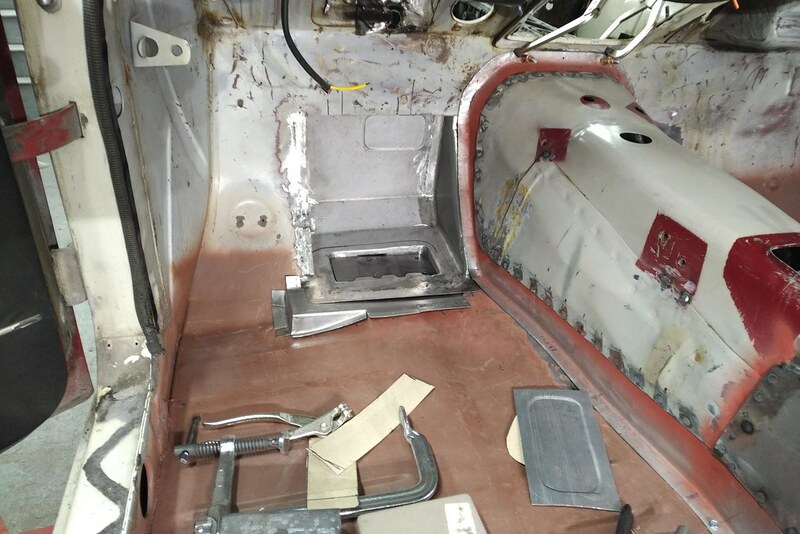 So I'm not going to do it...when the seats go in and I can test the pedals, I may change my mind. Another thing to consider is the extra space for that Vintage Air unit on the pass side. On the drivers side it allows the installation of a foot operated e-brake if you want to use one (I did and I love it)! Latest installment. This is the video of the drivers floor rework.